Hello world!, I'm Pepe from Chile. Montezuma Again! is a romhack for Montezuma´s Revenge (Parker Bros. Version) for Atari 800 computers (800XL, 65XE, 130XE), and it's my personal tribute to this great game. 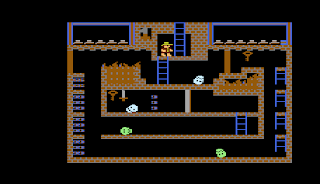 This romhack is meant to be played either on an emulator or the Atari itself, and it includes a total of 72 rooms, most of them completely new. Lot's of work has to be done in order to complete this new pyramid, and I know it's annoyingly hard. I hope I'll publish new pyramids and rooms (easier ones) in the future. Because of the high level of difficulty, I set the total lives to 200, so that you can explore as much as you can. I'll like to thank MatoSimi, as I'm using (with his permission) part of his AtariMapMaker code in order to make a "Montezuma Map Maker", for short: "MonteMaker", which has saved me hours of work designing and testing all 72 rooms. I hope I'll publish MonteMaker somewhere in the future, but for now, it's still in its infancy. If you find any bug, please let me know in the comments.